The headlines made for grim reading. According to Cancer Research UK, in the US, 1 in 2 women and 1 in 3 men will develop cancer in their lifetime. Now, a similar rate has been reported in the UK, with a new study published in the British Journal of Cancer claiming 1 in 2 men and women will be diagnosed with the disease at some point in their lives. That’s 50% of the population born after 1960 and although we all knew the risks were increasing, all of a sudden, everyone felt concerned. « The silver lining here is that these statistics are somewhat misleading » states Pr Bill Kaelin of Harvard Medical School « as life expectancy increases and cancer is first and foremost a disease of the old, it’s entirely normal that half of us would be impacted in our old age. It’s just that in the past, you would have probably died of something else that is now treatable ». As well as teaching medicine at Harvard, Prof Kaelin also chairs the research committee at the Dana-Farber cancer institute in Boston. He was invited to speak in Geneva at the inCircle event organized by Grégoire Haenni before attending the World Economic Forum in Davos. By way of background, cancer is a cluster of rogue cells that escape the body’s normal controls (especially the cell division process). 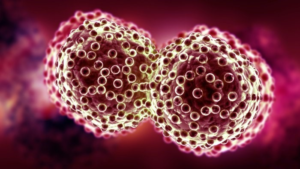 They can spread or metastasis and until recently, oncologists would treat patients with a combination of radiotherapy, chemotherapy and operations. In the world, 14 million people are diagnosed with cancer every year with 8 million subsequent deaths. The leading causes of death are bowel, lung and breast cancer. Because of this, oncology sales in big cap pharma have doubled in 10 years showing compounded annual growth rates of 12% per annum (with the rest of the industry growing at 6% per annum) according to Kaelin with the main factors being: people living longer, the availability of new drugs for chemotherapy and the appearance of targeted agents (i.e. specific drugs). And there has been some good news too in combatting the disease. In 20 years, mortality levels dropped by 20% with patients expecting to live 3 to 5 years once they’ve been diagnosed. « In the 70s, it was much lower. The main factor pushing up survival rates is the fact chemotherapy is less crude nowadays. Essentially chemo was about poisoning the patient whilst positioning the tumour even more. As it had larger amounts of blood flow it would naturally absorb more poison and doctors had to strike a balance between lethal toxicity to both the patient and the tumour » opines Kaelin and goes on to add « today we have help from primary prevention (i.e. avoiding cancerous compounds in our daily lives and diet), early detection and less toxic drugs. We now know that cancers use a cloaking device to trick the immune system and escape….and we’re much better at reading their tracks. There have been a few seminal events in the past 50 years that have helped. The main impetus came from Watson and Crick’s discovery of the double helix and the role played by DNA in protein formation. Then came the draft of the human genome by Craig Venter at Celera genomics in 2000. It ‘cost Craig’ $1Bln at the time but now for $1000, you can get it done. Thanks to this technology, we get a precise ‘parts-list’ of our genes. There’s less guess work as to what the genes in our bodies are and how they work. but more specifically, a cell has acquired a mutation at some point in its life (it takes 5 to 10 mutations to escape controls). We now know a partial combination of these mutations can lead to cancer. If you look at all genes playing a role in cancer, there are approximately 500 to 20,000. « New drugs need to find a specific spot to affect proteins and essentially change their configuration » states Kaelin. « Enzymes have shown to be good targets with only 5% of potential targets exploited by the drug industry at present. With targeted clinical trials, we can now focus on the patients which have very high responsiveness to the medication (i.e. good responder id), sequence the genome of their tumours and try to assess why the drug showed such high levels of efficacy. In essence, it leads to greater efficiency, they’re better tolerated by the patient, it’s a better value proposition and less costly to produce. We’re winners all around ». Novartis’s Gleevec is a poster child for the industry and affects an enzyme (kinase) linked to growth and metabolism in healthy cells but when it mutates, can play an important role in cancer development. It acts as a kinase inhibitor in certain rare forms of leukaemia and, anecdotally, the research on the drug was meant to be discontinued 10 years ago. It wasn’t judged to have much commercial potential as the disease ‘only’ affected such a small segment of the population. They’re probably glad they kept it: Gleevec generated $6Bln in sales last year for Novartis. Genentech’s Avastin and Herceptin went after what was also seen as a small market and are now generating $8Bln in sales. Again, for drugs that have shown efficacy, the numbers can be staggering. « 50% of innovation comes from small biotechs where big pharma act as harvesters and acquire smaller names. They’re now working on 2nd generation kinase inhibitors these days that are more specific and carry less toxicity » states Kaelin. « Immuno-oncology is the next step whereby a compound binds to a receptor on cancer cells which is then recognized by the patients immune system (T cells) and attacked. In the big cap pharma space Roche, Bristol Myers and Merck all have growing immune oncology franchises. By way of example, Bristol Myers are working on a new immune-targeted approach to cancer treatment that is being heralded as the next big thing in oncology after 2 investigational agents created unprecedented durable tumour response rates in 3 cancers. The approach uses monoclonal antibodies to neutralize the programmed death 1 (PD-1) protein and its partner molecule (PD-L1), elements of tumours that enable them to evade their nemesis — the immune system. PD-1 was discovered in 2012 and works well on melanomas (skin cancer) and could cure cancer all together » concludes Kaelin boldly. It’s worth pointing out that since Bristol-Myers Squibb (BMY: NYSE) launched the first immune-oncology drug against melanoma in 2011, the market took notice and the stock has doubled. Bristol-Myers now holds an 80% share of the fledgling immuno-oncology marketplace, which is expected to reach $40 billion within five years (source: Barron’s). Their latest drug in this segment could have sales of $8Bln. They’ve reported very strong numbers and have issued very strong guidance again mainly thanks to their immune oncology franchise. In the latest sell off this year, the stock has weakened somewhat giving investors a great opportunity to get in the name (from $71 to $63). It’s not the cheapest stock in the world at 20X consensus estimates for 2017 of $3.04 but quite a few analysts think an earnings multiple of 25 times is merited (which would translate to a $76 stock price). By way of comparison, Merck and Astra Zeneca now trade at 14 and 12X respectively but with drugs with much less potential. Watch this space.